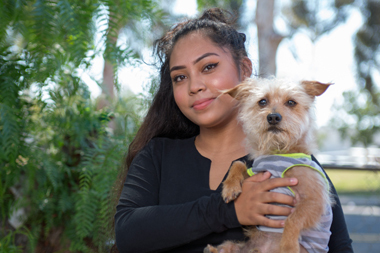 It was the second clue that 16-year-old Katie Mendez wishes she would have recognized in her own dog, Floppy, in May, when she hugged him and he snapped at her, slashing the left side of her upper lip so deeply that it required plastic surgery to repair. A member of the family since he was a puppy, Floppy is a 15-pound terrier mix that Katie says is very friendly with both kids and adults. “But I guess I sparked his anger,” she says. The bite happened so quickly that Katie wasn’t aware of how serious it was until she went to the bathroom and noticed the blood. Her family rushed her to the Sam S. and Rose Stein Emergency Care Center at Rady Children’s, where physicians determined that Katie would need plastic surgery. ER staff cleaned Katie’s wound and sent her home that night. In the morning, she saw plastic surgeon Thomas Vecchione, M.D., also an associate clinical professor of plastic surgery at UC San Diego, who operates on several dog bite victims each week at Rady Children’s. Over the past five years, the Emergency Care Center has seen an average of 250 dog bites each year, or roughly five bites every week. Katie’s laceration was so deep that it affected all the muscles in her upper lip and mouth, requiring a three-layer closure with dissolvable stitches that fell out on their own after about a week. As with most dog bite victims, she was prescribed antibiotics to prevent infection. The most important part of the procedure, according to Dr. Vecchione, was the aftercare to ensure proper healing and reduce scarring. For Katie, time and proper care have already allowed for near-perfect healing. What is cool is that Katie feels the incident has brought her and Floppy closer and taught her a valuable lesson about her furry friend and all dogs in general. When you love a dog as a member of your family, it’s hard to think of the pet as a potential threat. Unfortunately, research has shown that more than 70 percent of bites are from dogs we know and love, and all dogs have the potential to bite, says Kay Moore, R.N., a pediatric trauma nurse at Rady Children’s Hospital-San Diego and a certified professional dog trainer. The good news is that these bites can be prevented if both adults and children can recognize the clues in their canine’s body language. “Dogs tell us with their bodies when they are uncomfortable and would rather be left alone,” Moore explains. Finally, do not approach a dog you don’t know without asking the owner first. Watch the dog’s body language cues to see if he wants to meet you; if not, leave him alone.